Over the last couple weeks I tended my neighbor’s garden while they were on vacation. After making vats and vats of fresh salsa (which don’t get me wrong is delicious) I needed something new to use the bushels of tomatoes I harvested over the weekend. And, I needed forced portion control on all the blue corn tortilla chips that were involved in eating all the salsa. In my pantry I had a can of organic garbanzo beans, garlic and just picked basil from right outside my door as well. That was the beginning of this smooth, creamy, full-of-flavor dip. I also recently purchased a Blendtec from Costco, which is my new favorite piece of kitchen equipment, totally worth the investment. Along with hummus, the blender creams almonds, spinach and frozen fruit like you wouldn’t believe. 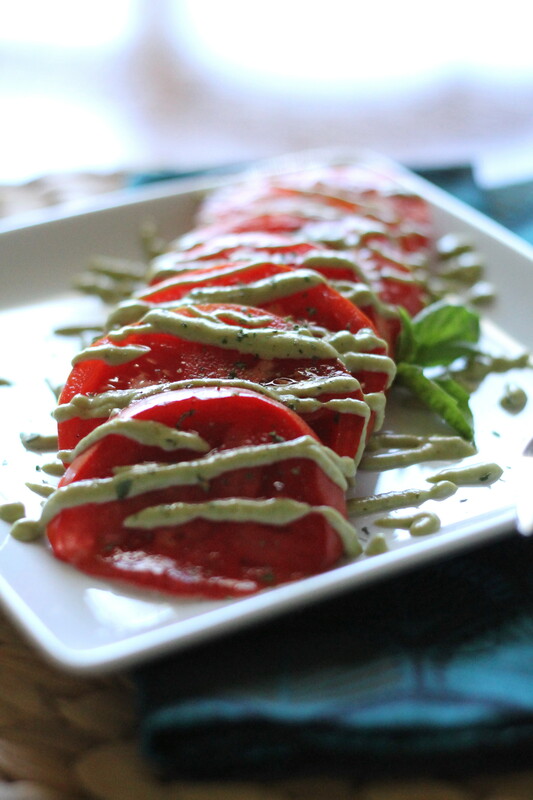 I then drizzled hummus over sliced, home grown tomatoes sprinkled with sea salt and black pepper. A great appetizer or side dish with grilled chicken or fish. 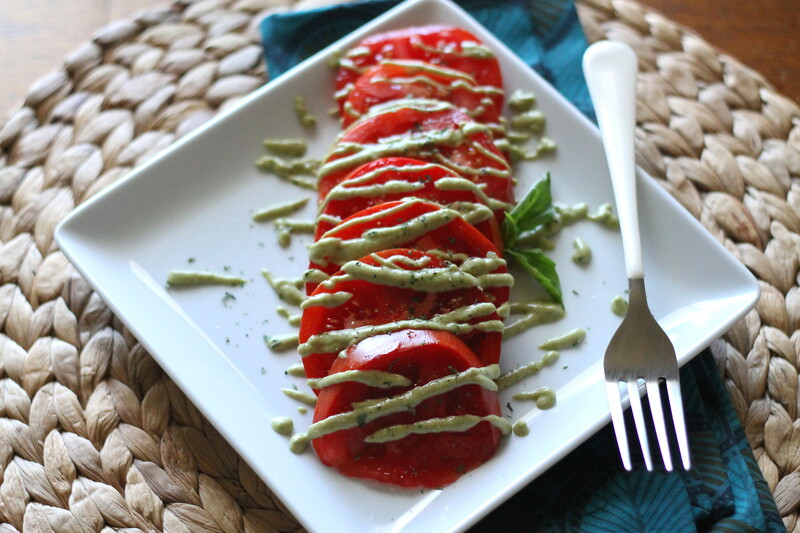 Sort of a twist on Italian caprese salad. If you eat dairy feel free to add a few thin slices of fresh mozzarella. 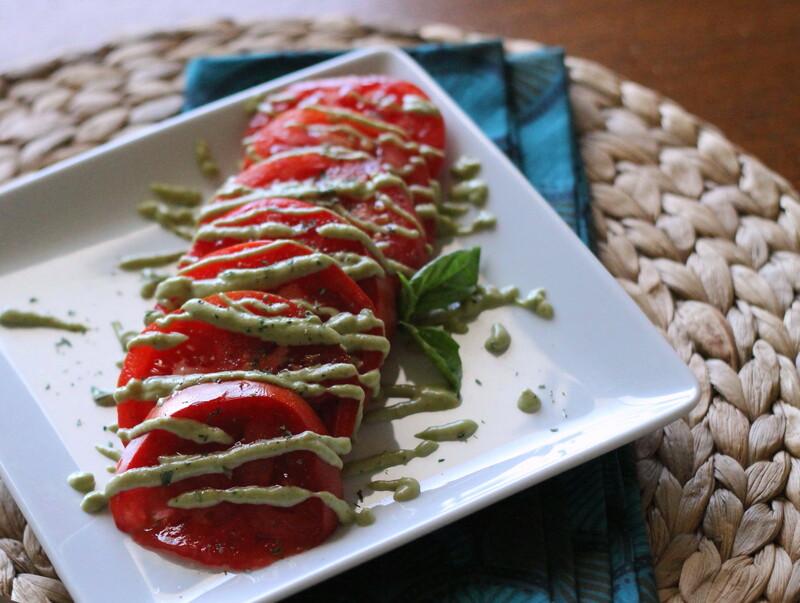 If you’re looking for a new way to use fresh tomatoes or boost the flavor of fresh or grilled veggies this is a recipe for you. 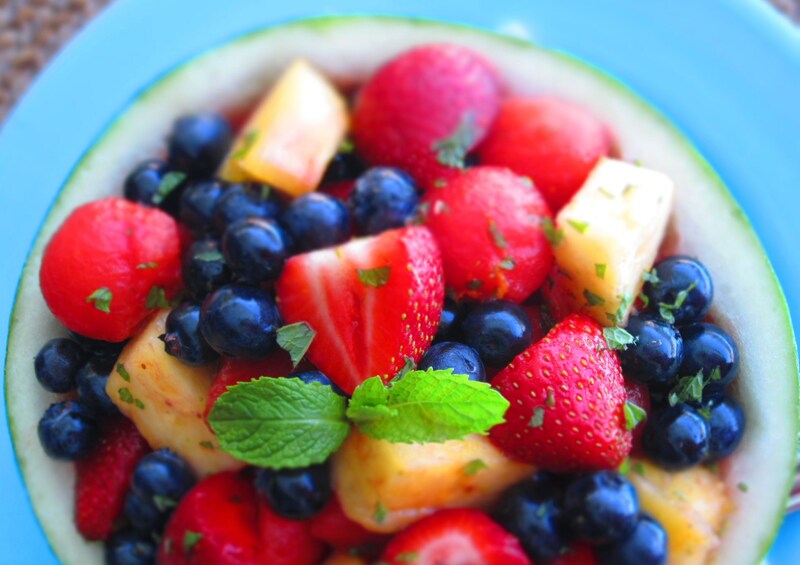 Clean, nutritious and summer flavor-full. In a blender or food processor add beans with liquid, fresh lemon juice, basil, sea salt, pepper and olive oil. Blend until smooth and creamy. Pour into an airtight container and store in the refrigerator. 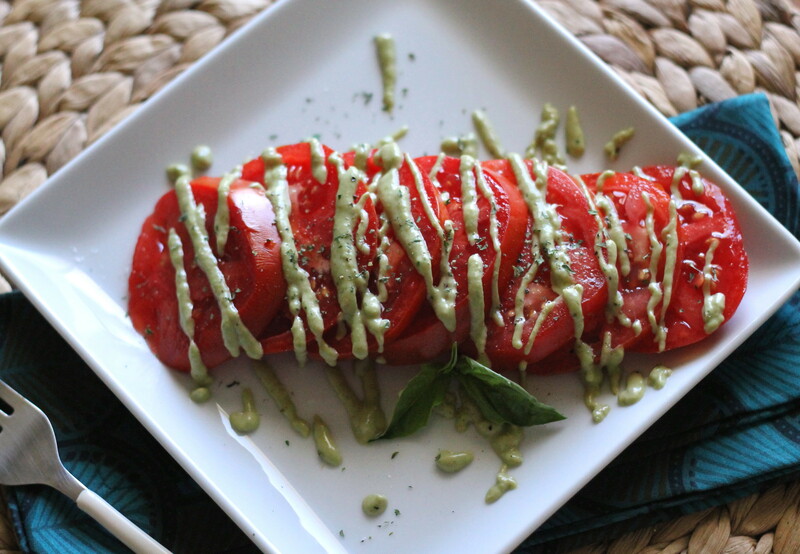 Serve drizzled over fresh tomatoes sprinkled with sea salt and pepper, or as a dip with fresh or grilled veggies (broccoli, zucchini, eggplant, cherry tomatoes, carrots, celery, etc). My friend Rebecca, a chiropractor at 4:40 Chiropractic, has some great stress and tension relieving exercises on her website. I’ve been obsessively doing the one for neck paint and tightness (my trouble spot). It’s amazing and I’ve noticed a huge difference since doing. 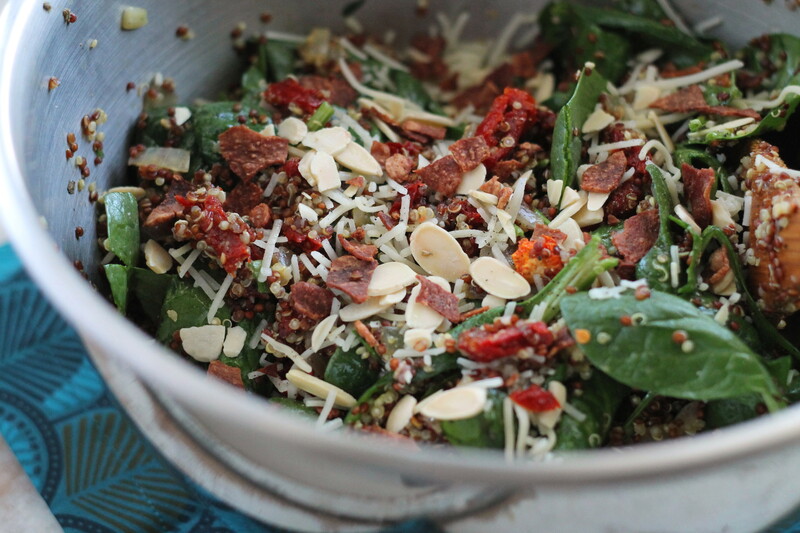 A cheerful salad for any time of year, but I love the red sun-dried tomatoes against the bright green, fresh baby spinach for a healthy holiday time dish. If you like and have walnuts please toss some in. 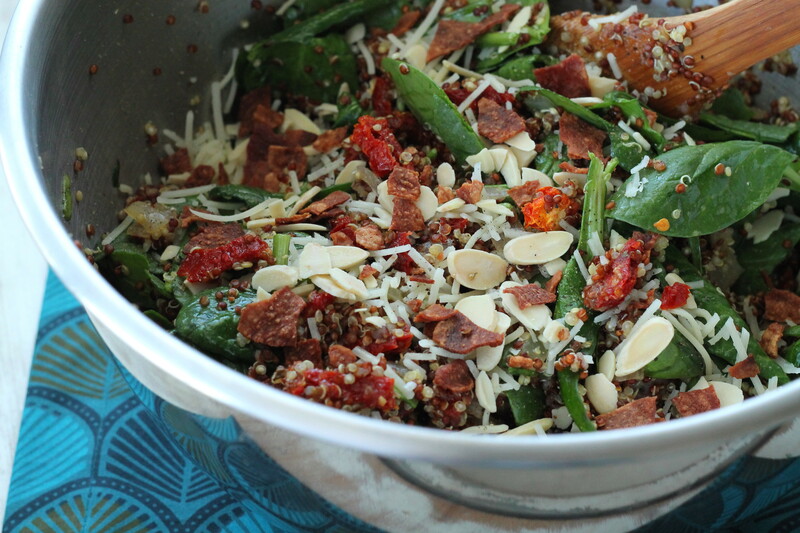 I ran out and had to use toasted, sliced almonds which were great, but I made this salad for a dinner party a few weeks ago and the combination of toasted walnuts and crunchy turkey bacon was out of this world. It got wild reviews and I’ve made it a couple times since then. Sun-dried tomatoes are a beautiful ingredient. My husband jokes the intoxicating element makes any recipe better, they’re like bacon, you can put them in anything and he’ll eat it. Easily made ahead side, store in fridge and top with bacon, cheese and nuts before serving. I served this salad at the dinner party I mentioned alongside Lemon-Herb Roast Chicken (made without potatoes and carrots in crock pot), Roasted Garlic Broccoli and for dessert Easy Berry Crisp (but substituted chopped apples with a little applesauce for berries). Delicious! My current go-to weeknight and entertaining salad. Gluten and dairy free options below. 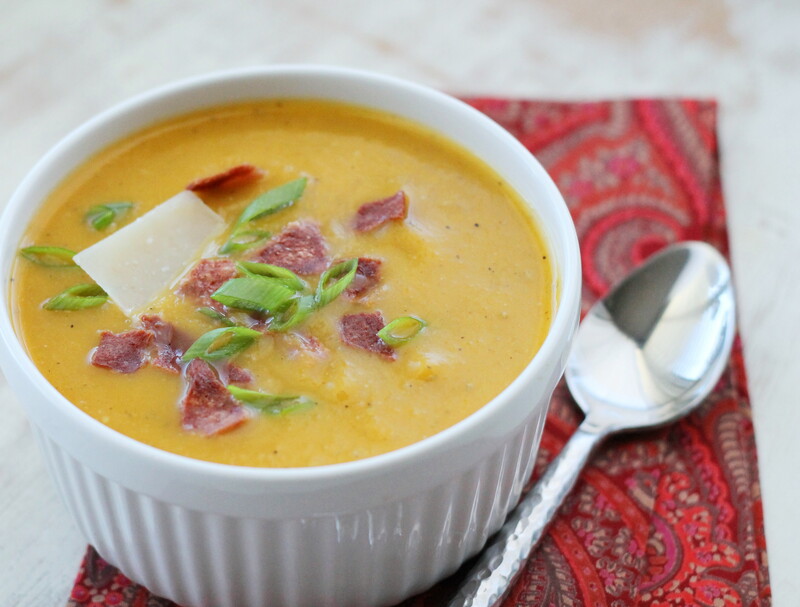 *Gluten Free Option: Use GF turkey bacon and vegetable broth. **Dairy Free Option: Omit Parmesan cheese. 1. In a large skillet (use one with a lid) sauté onion in 1 T. olive oil with garlic, sea salt and pepper for 4-5 minutes over medium-high heat until softened, pour 1/2 cup white wine into pan (I used Chardonnay but any dry white will do or broth). De-glaze pan with onions until wine is reduced. 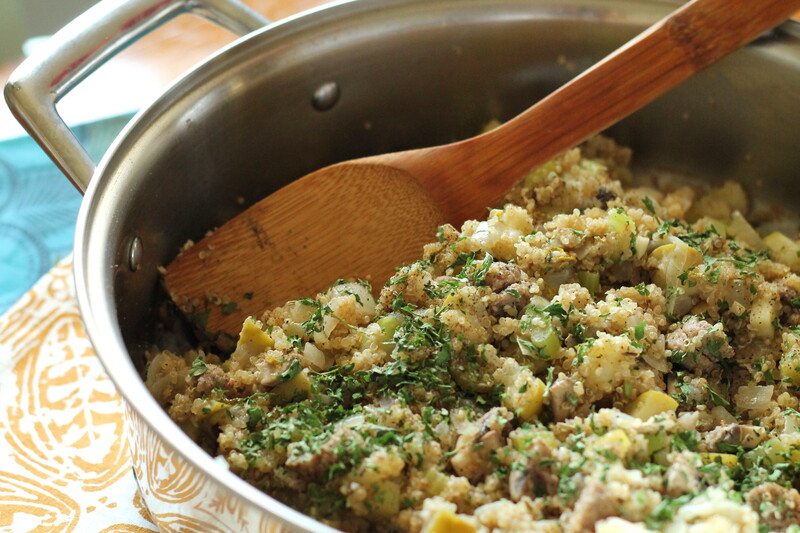 Add quinoa and toast with onions and wine, stirring frequently, until completely absorbed (about 2-3 minutes). 2. Add 1 1/4 cups broth to skillet; stir, cover and bring to a boil. Reduce heat to low and continue cooking until liquid is absorbed, about 20 minutes. Fluff with a fork. 3. 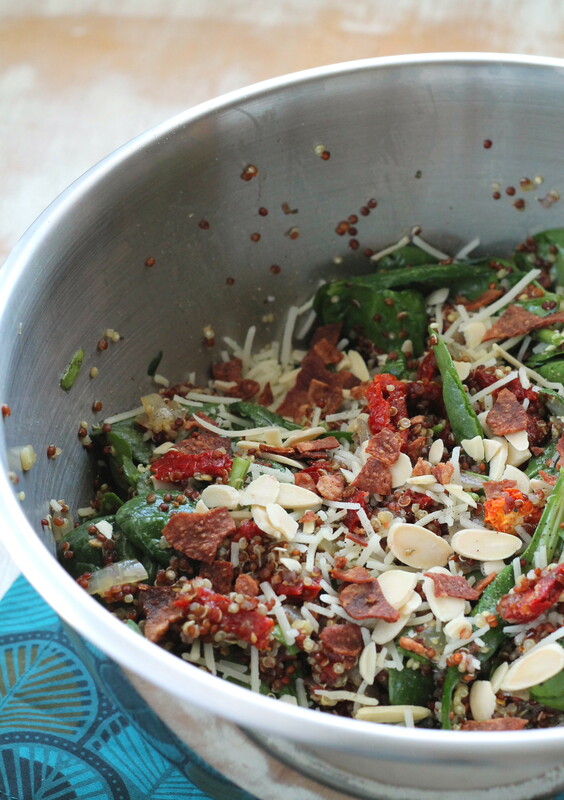 While quinoa cooks combine sun dried tomatoes, remaining 2 T. olive oil, lemon juice, Italian seasoning and spinach in a large bowl. Add cooked quinoa (while still warm), toss to coat. If serving cold refrigerate until ready to serve, skip to step 4 if serving warm. 4. 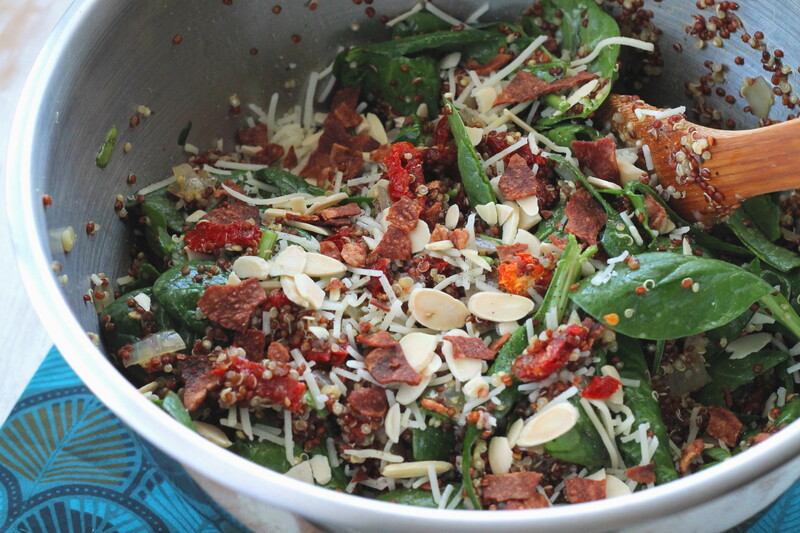 Top salad with cooked and crumbled turkey bacon, toasted walnuts and Parmesan cheese before serving. Season with sea salt and pepper to taste. Serving size, about 2/3 cup. 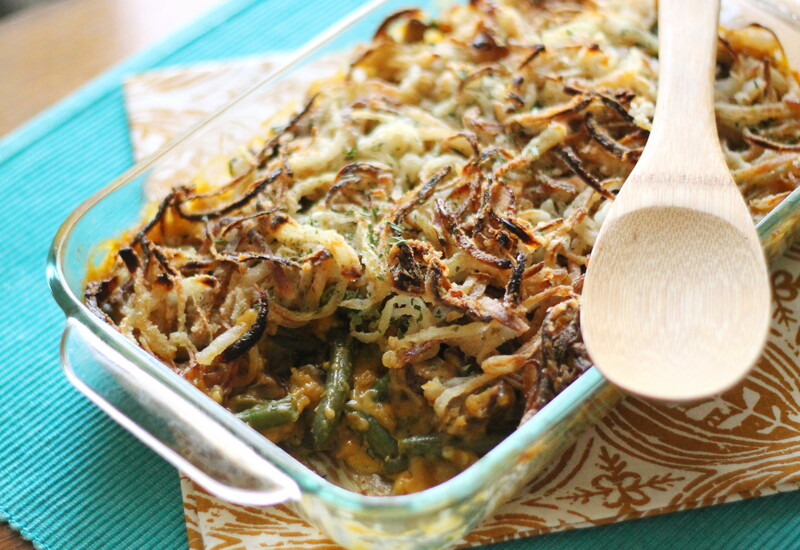 A healthier alternative for the high fat, sodium soup laden and processed green bean casserole. We made this in a recent healthy holiday cooking class I taught and it received rave, rave reviews by all. Students were doubtful at first glance. 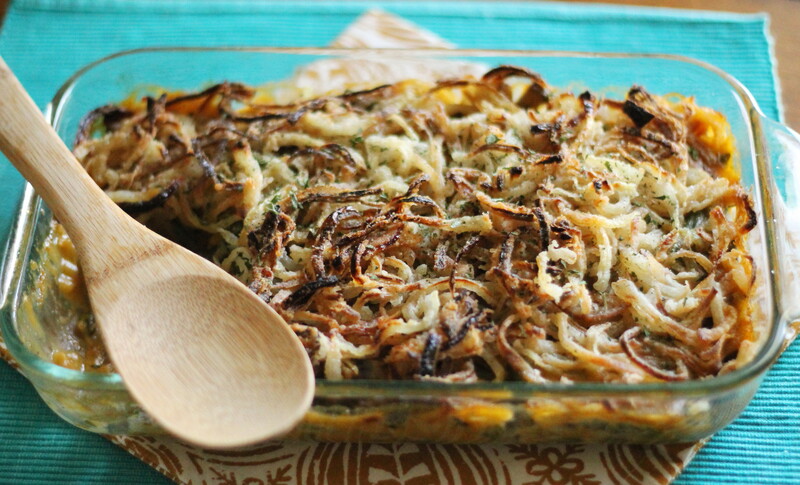 Could this really substitute the beloved casserole topped with crunchy onions? But it happened, like landing a man on the moon. I love that – when eyes and taste buds light up in joyful realization and amazement of a classic dish re-purposed to enjoyably healthy. You also cook these up on the stove top (in 12 minutes), which equals more room in your oven Thanksgiving day. Sweet Potato Crunch Casserole Avid sweet potato avoiders at a cooking class loved this dish! Thanksgiving desserts coming the next time around! *Omit cheese for dairy free dish. 1. 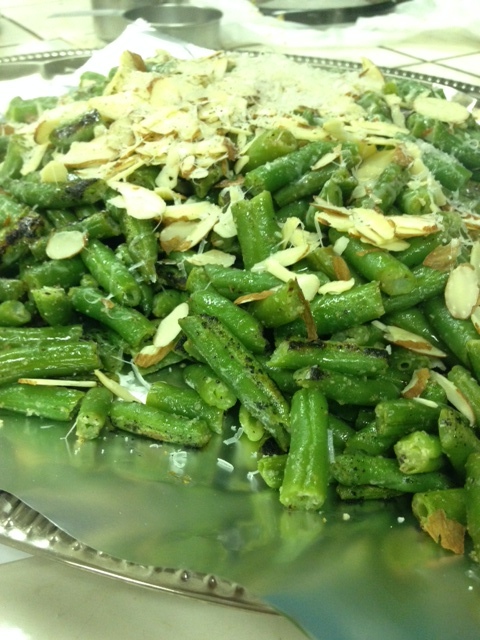 Trim ends if using fresh green beans (or thaw and dry if frozen). 2. Heat a large skillet over medium heat, add oil and green beans. Sauté for 8-10 minutes, or until crisp-tender and starting to brown (fresh beans may need to cook slightly longer). Add garlic, salt and pepper, cook 1-2 minutes longer. 3. 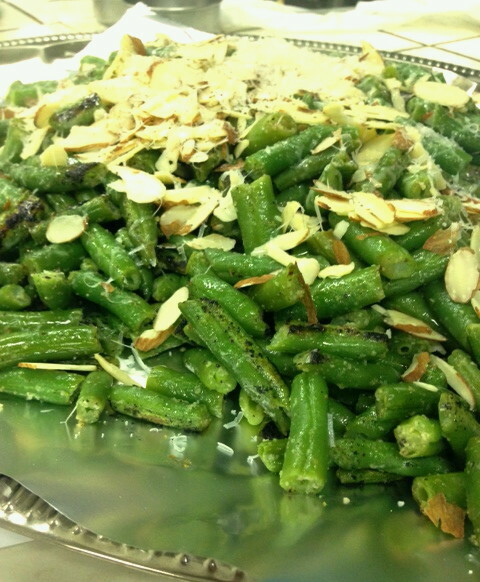 Place on a platter and top with sliced almonds and fresh Parmesan if desired. Serve immediately. Serving size, about 1/2 cup. 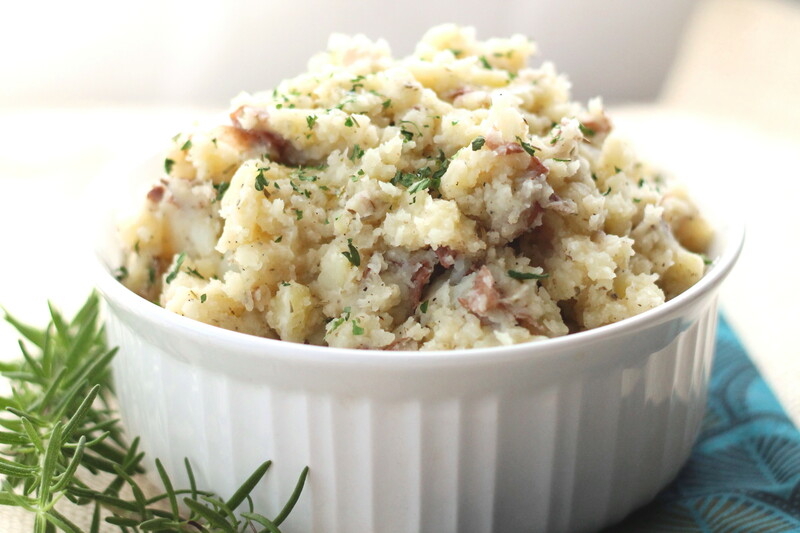 VARIATIONS: Top with cooked and crumbled lean turkey bacon or add roasted baby potatoes. 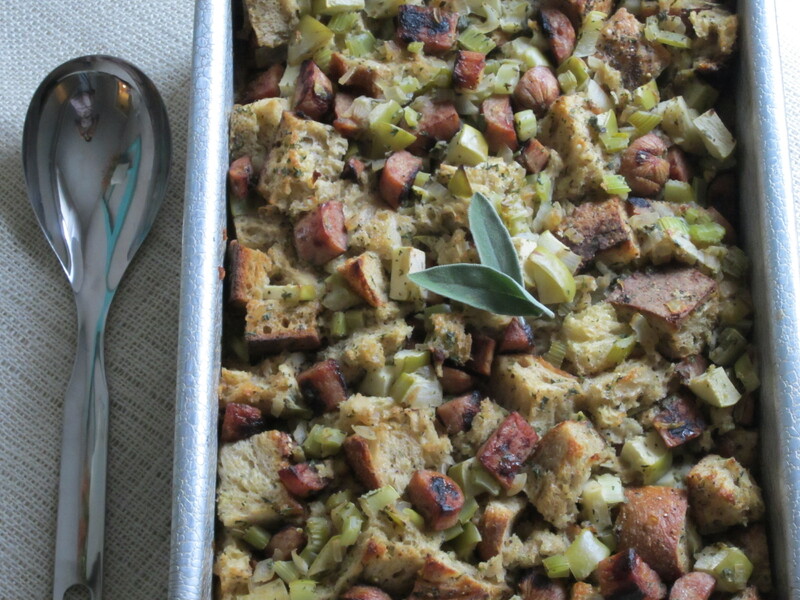 The past few weeks I’ve been aching to make a Thanksgiving stuffing with quinoa. It was a success in my book! I took all the traditional flavors adding lean turkey sausage, sweet and tart granny smith apple and of course fluffy, nutritious quinoa for bread. 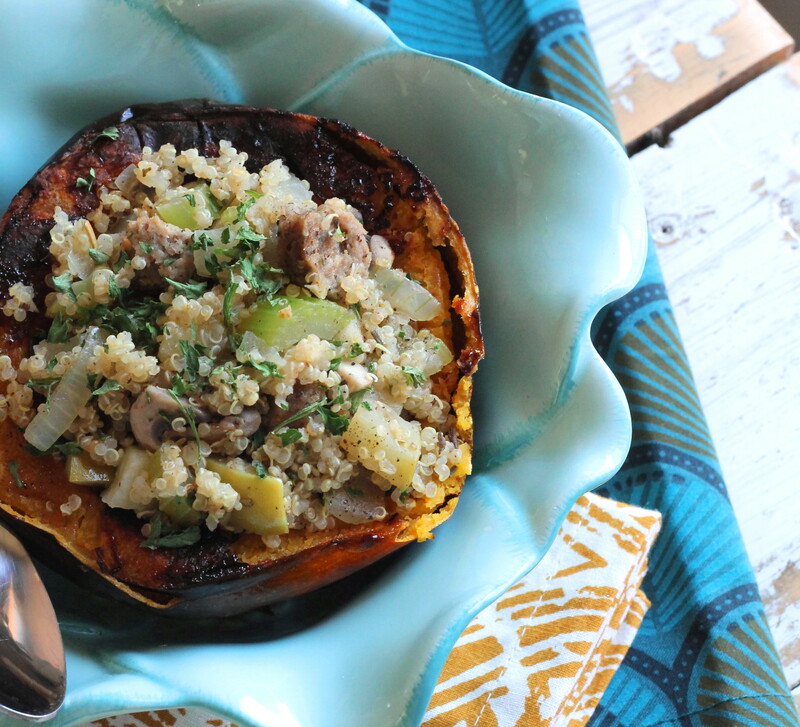 You can stop here and enjoy your delicious quinoa on a plate with turkey and other scrumptious sides or you can take it to the next level and stuff it in a roasted, caramelized rich squash. Simply out of this world. 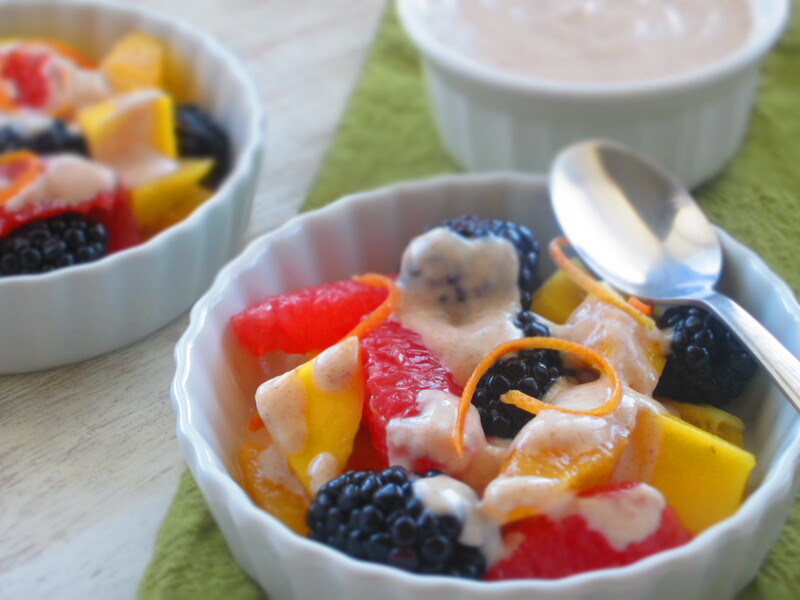 A healthy spin on a classic. I’m a firm believer anyone can eat healthy year round and still enjoy what’s on your fork. 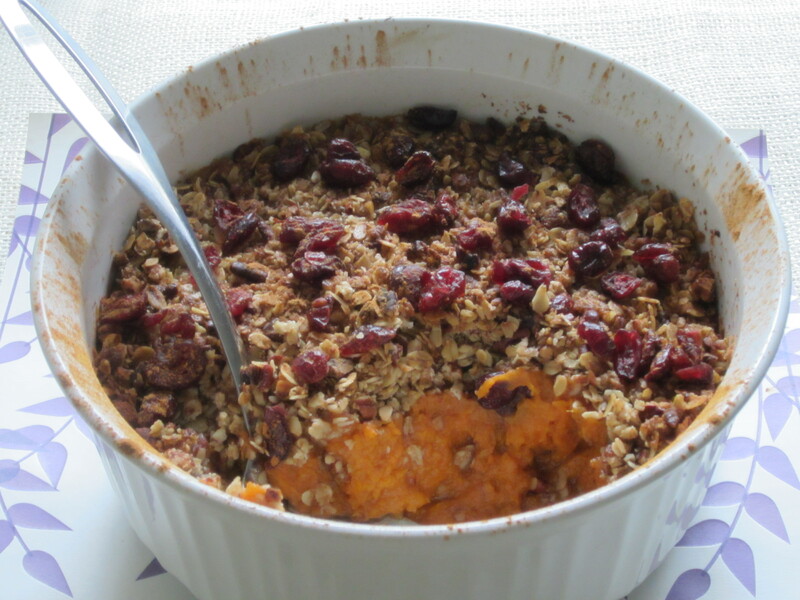 Feel free to make it your own by adding other seasonal ingredients like dried cranberries, pears, pecans or walnuts. A dish that will make you thankful for sure. And able to stand on the scale next week with confidence (and well fitting pants). Have fun with this one! *Gluten free option: Use GF chicken broth and turkey sausage (I used Applegate Farm brand 10 small turkey sausage links – microwaved and chopped). 1. Spray a large skillet with cooking spray; brown and crumble turkey sausage (or microwave if using pre-cooked links). Set aside. 2. In the same skillet, over medium heat sauté onion, celery, apple and mushrooms in olive oil with sea salt and pepper. Cook for 5-6 minutes until softened; add garlic, continue cooking 1-2 minutes stirring often. Set aside. 3. Using the same skillet, add rinsed and drained quinoa and toast about 1 minute stirring often. Add chicken broth, cover with a lid and bring to a boil. 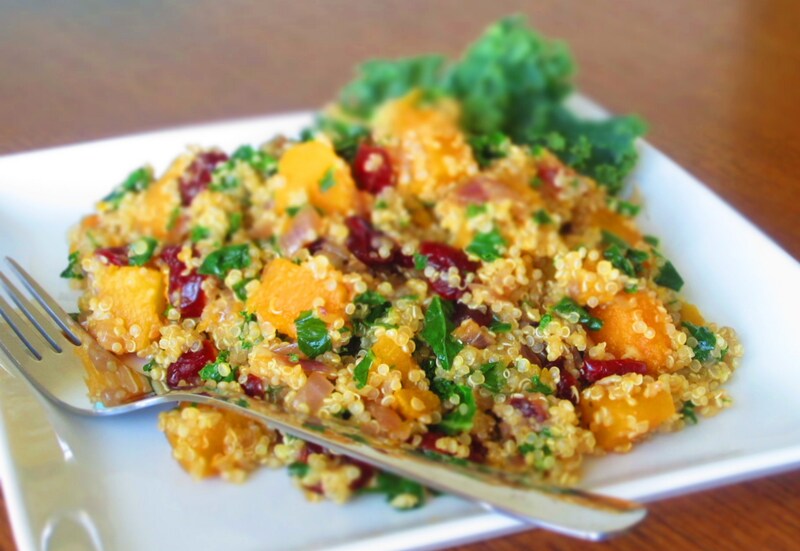 Reduce heat to low and cook about 15-20 minutes longer or until liquid absorbs and quinoa cooked. Fluff with a fork, then stir in cooked vegetables, turkey and all seasonings. Add sea salt and pepper to taste if needed. Make ahead and refrigerate, or serve hot immediately (I think it’s more flavorful after setting in fridge a day or two and reheating). 4. 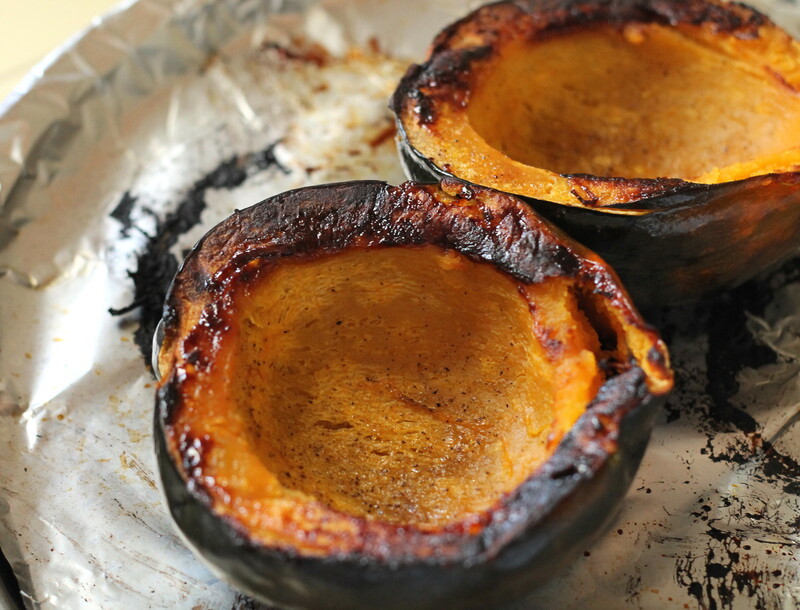 For roasted squash: Preheat oven to 400 degrees F. Half an acorn squash, removing seeds and strings with a spoon. Sprinkle inside with sea salt and pepper. Prepare a baking sheet lined with foil and sprayed generously with cooking spray. Place acorn squash cut side down on pan, bake 20 minutes then turn over and bake an additional 20-25 minutes, or until inside is soft. Drizzle each inside with 1/2 tsp honey and sprinkle of cinnamon, if desired. 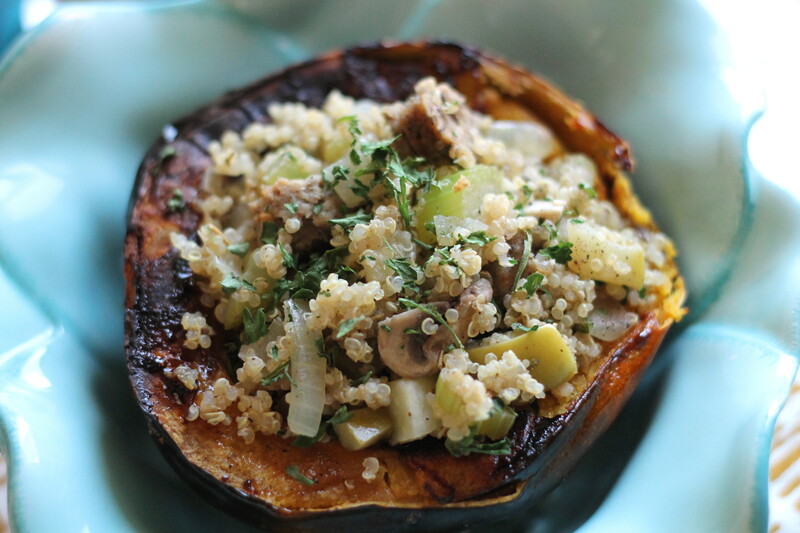 Stuff with quinoa stuffing and serve in individual acorn squash bowls. 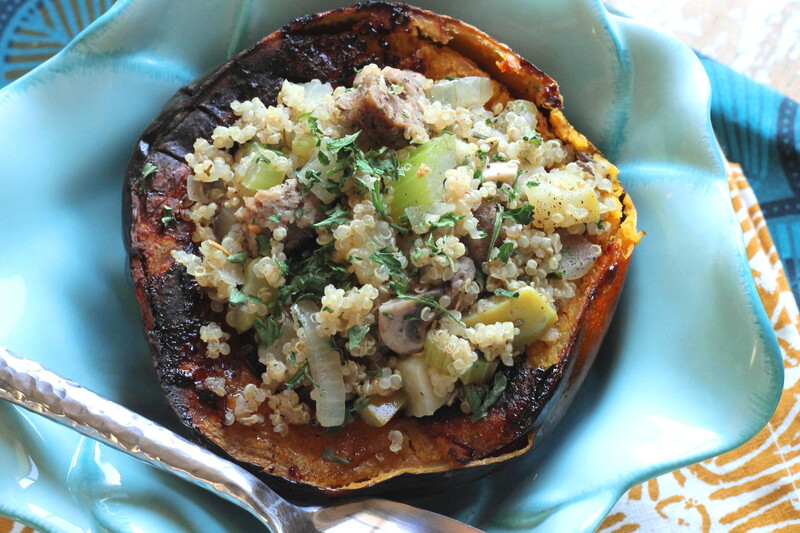 Serving size: half a squash with about 1 cup quinoa. VARIATIONS: Add dried cranberries, sub pears for apple, use 1/2 cup white wine with 1 1/4 cups chicken broth. Sub turkey bacon sausage. Top with chopped pecans or walnuts for crunch. Oh, wow. 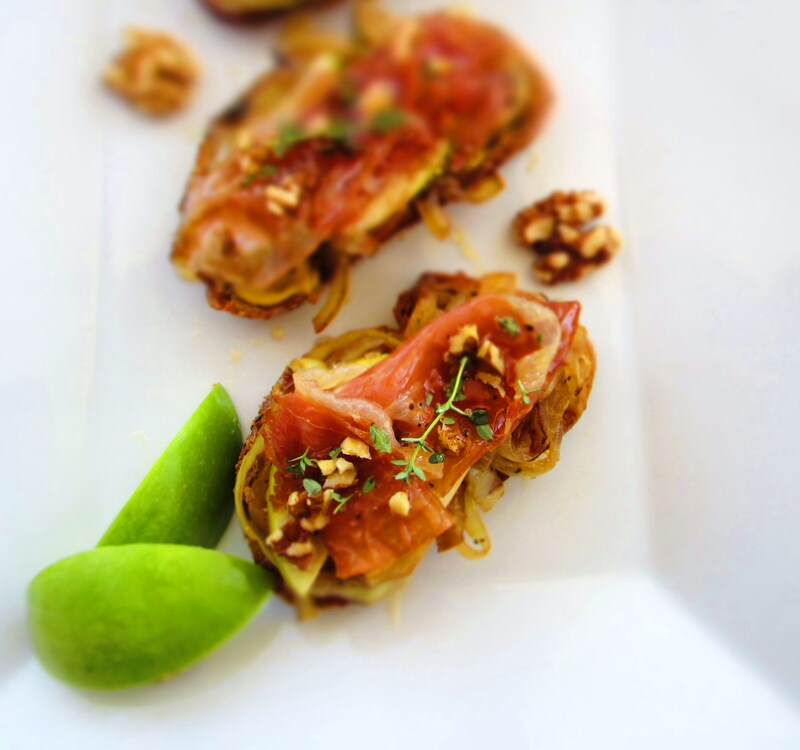 This appetizer is literally one of the best flavor combinations my taste buds have experienced. Who doesn’t love a good guacamole? I doctored mine up with diced cucumber and mango. 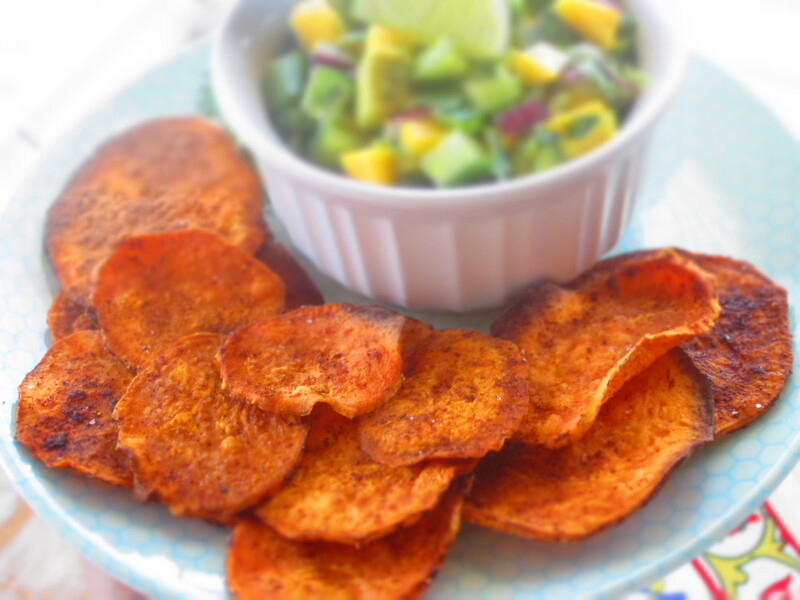 The sweet, the crunch, the creaminess, summer perfection especially on a crisp, homemade sweet potato chip. The seasoning on the chips is not to be missed. 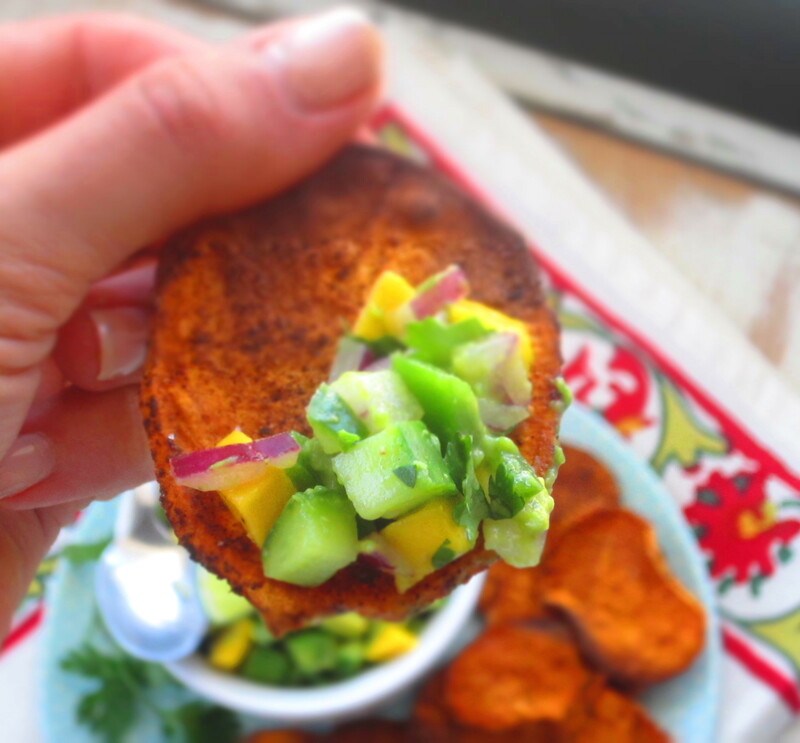 Chili powder, cumin, sea salt and the natural sweetness from the spud compliment the guac perfectly. So, please, please, please I beg you try not to skip the chips. If you don’t have time, there are some good store bought varieties or use regular corn tortilla chips, but add a couple pinches of chili powder and cumin to the guacamole to incorporate the spice from the chips. Double or triple the sweet potato recipe if making to serve more than four people. I can’t say enough about this heart healthy appetizer. You’ll just have to try it out yourself. A guaranteed new favorite around your summer patio table. Also, gluten free, dairy free and wonderful for people with diabetes or blood sugar concerns. Guacamole is low in sugar, carbs and high in fiber. 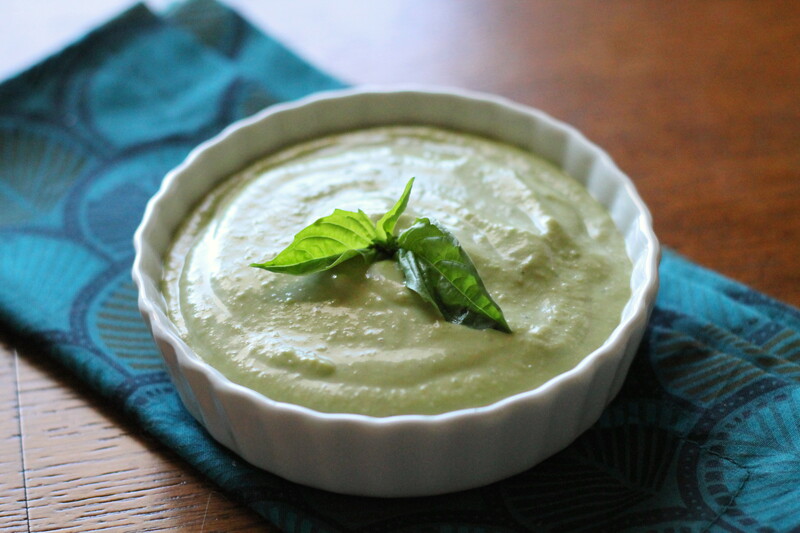 Try topping guacamole on a salad, grilled chicken or for dipping raw veggies like celery. So refreshing ~ enjoy! * I used the Persian mini cucumbers, but any small, regular seedless cucumbers work. 1. 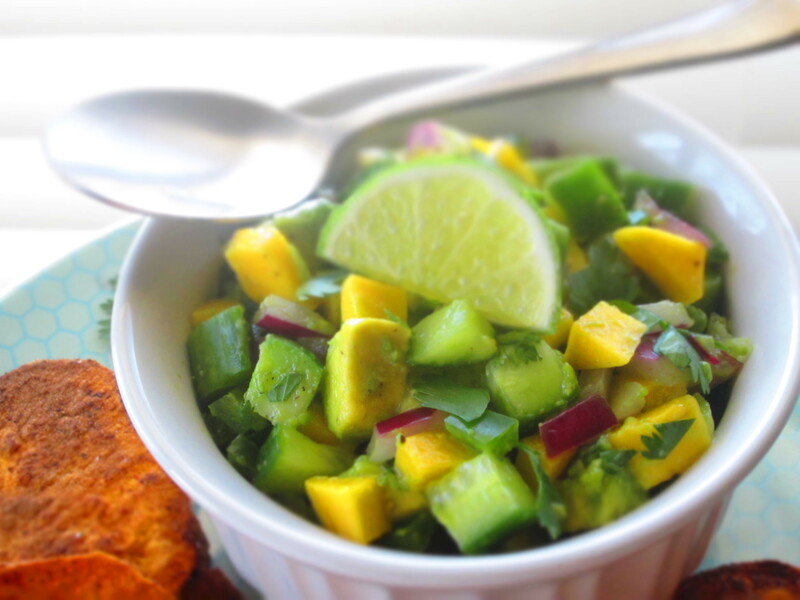 In a large bowl mix chopped mango, cucumber, jalapeno, onion, grated garlic, cilantro and half the chopped avocado. Mash the remaining avocado slightly with the back of a fork and add to bowl. Season to taste with sea salt and pepper and stir to incorporate. Serve immediately or chill covered tightly with plastic for up to 1 hour. Makes 10 servings. 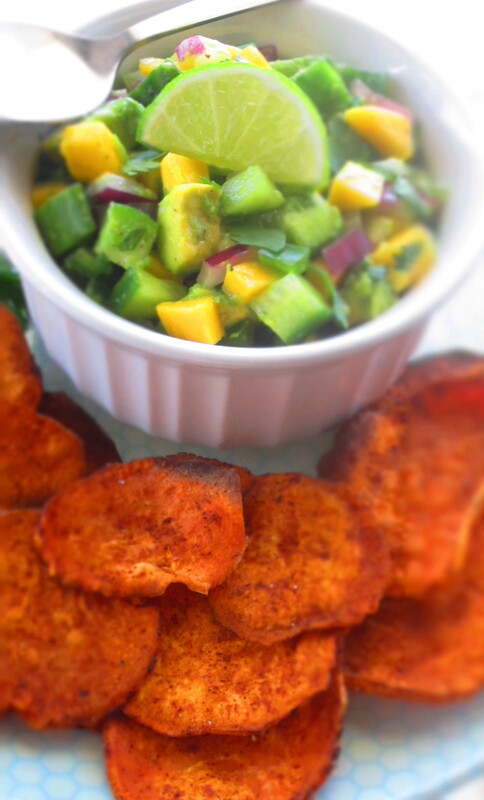 Serve with baked chili sweet potato chips, tortilla chips or raw vegetables. Serving size, about 1/4 cup. VARIATION: Great topping for chicken grilled chicken or salads. Use chopped fresh pineapple or tomato for mango. 1. Preheat oven to 400 degrees F. Spray 2 large baking sheets with cooking spray or line with parchment paper. 2. 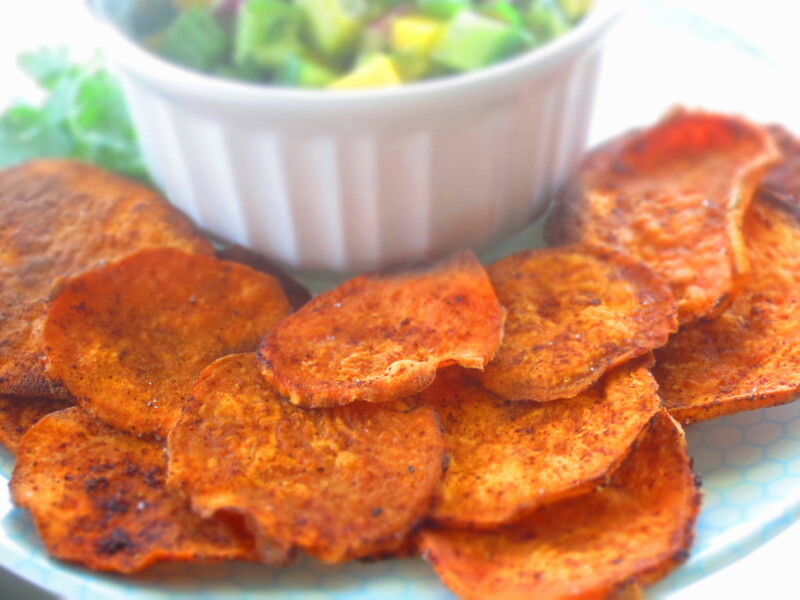 Cut sweet potato into very thin slices using a mandolin or food processor with attachment. 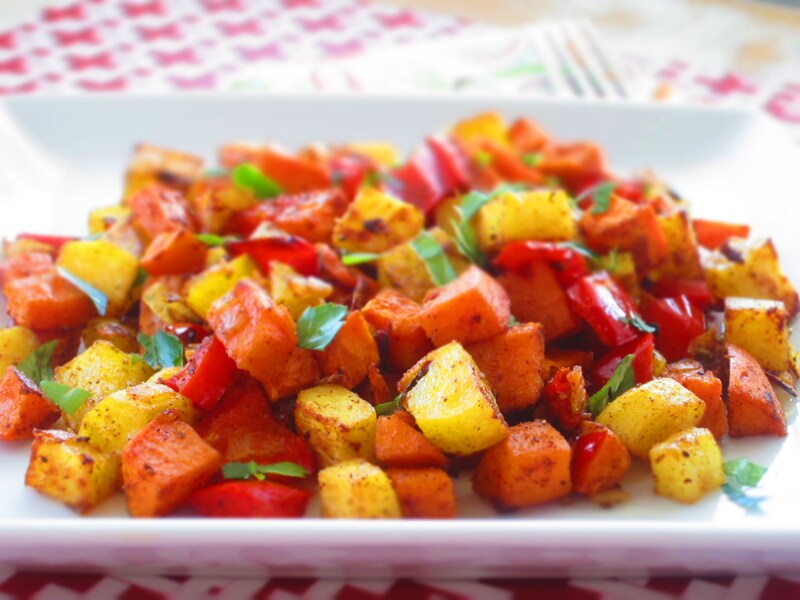 Toss sweet potato slices with olive oil, chili powder, cumin, salt and pepper with hands, rubbing seasoning on all potatoes to coat both sides well. 3. 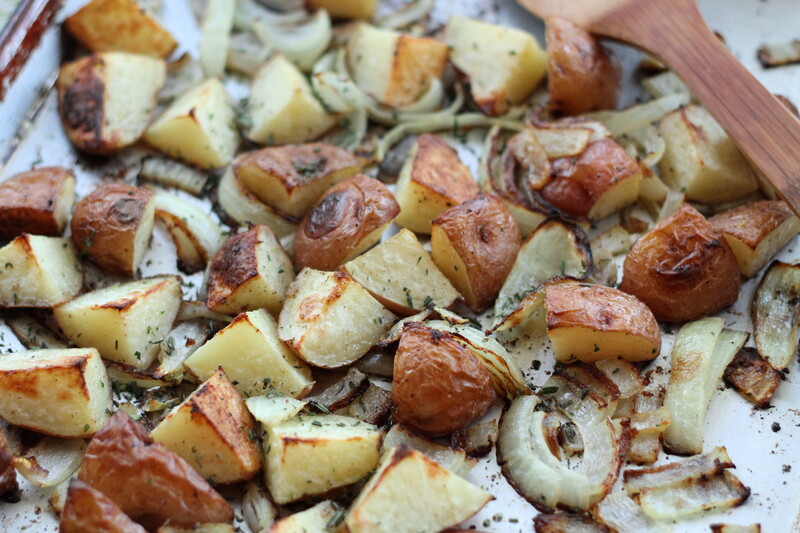 Place seasoned potato slices in one layer on prepared baking pans, don’t overlap. Bake for 10 minutes and flip. Bake for another 5 minutes and check to see if any look well browned and remove. Continue baking and checking until all are done (they can burn quickly so keep a close eye on them). Place baked chips in a single layer on parchment paper to dry and crisp up. Sprinkle while warm with additional sea salt if needed. Serves 4. 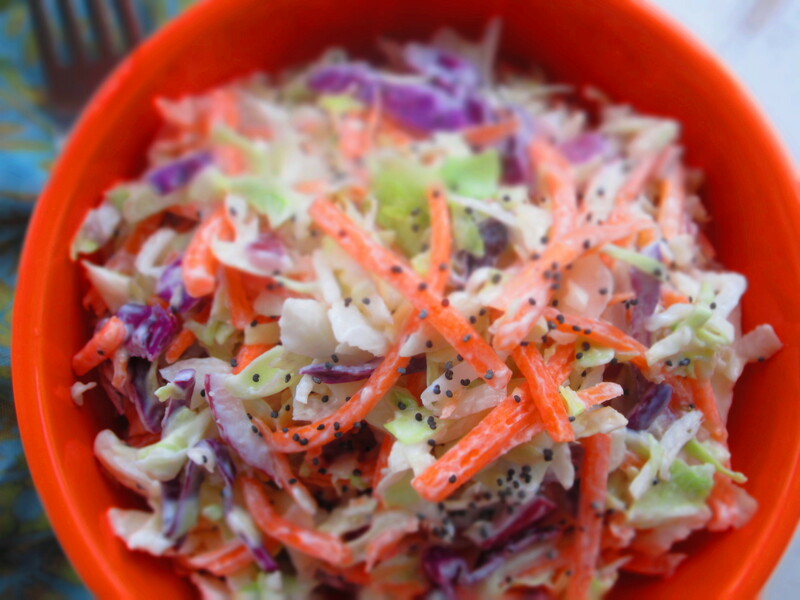 Cole slaw reminds me of picnics and good old fashioned lawn parties. Yes, the kind where the bocce balls are flying, the grill is flaming and lemonade is flowing. Ahhh, summer. I love summer. 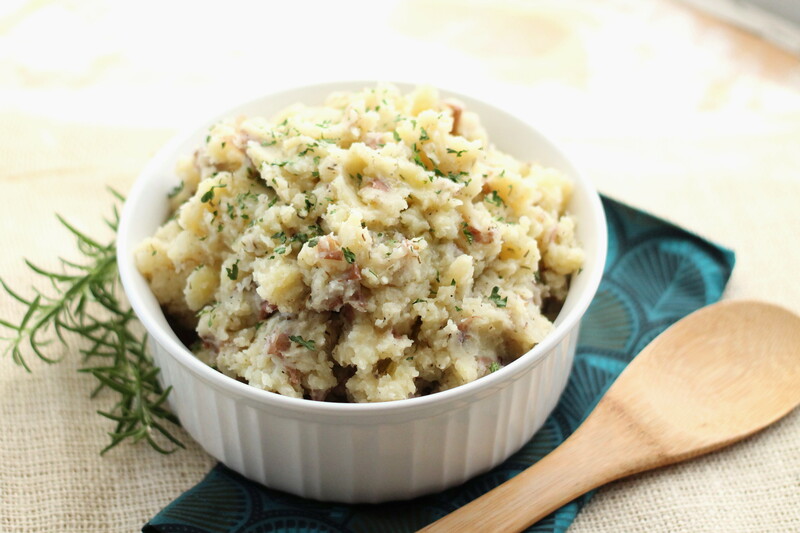 This side dish would be a remarkable addition to any Mother’s Day picnic, barbecue or sit down lunch. Along with all upcoming summer potlucks. I’ve kind of had a crush on poppy seeds lately. If you haven’t noticed, I buy an ingredient and can’t refuse adding to a recipe when it stares me down from the lonely pantry shelf. What can I say I’m sympathetic, or empathetic, or maybe just pathetic. 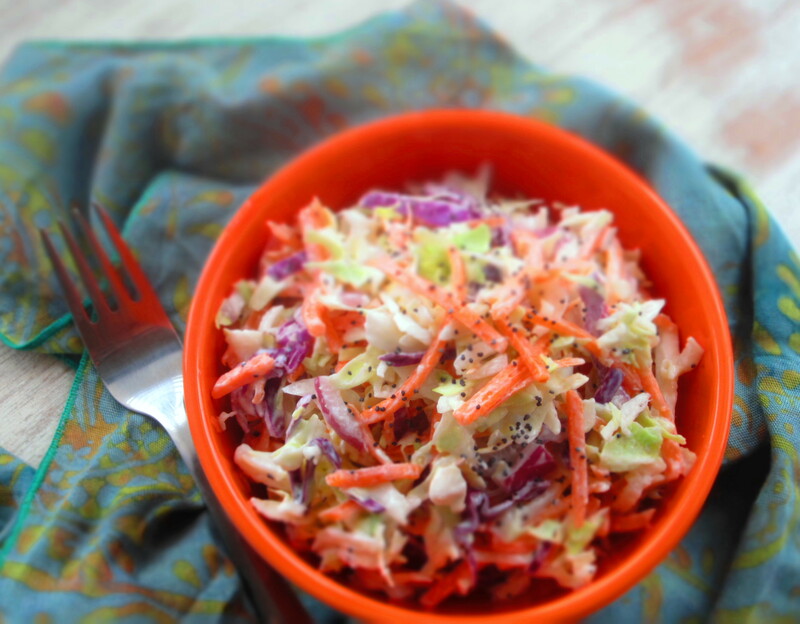 Whatever state you’re in, this lightened up cole slaw is a winner. 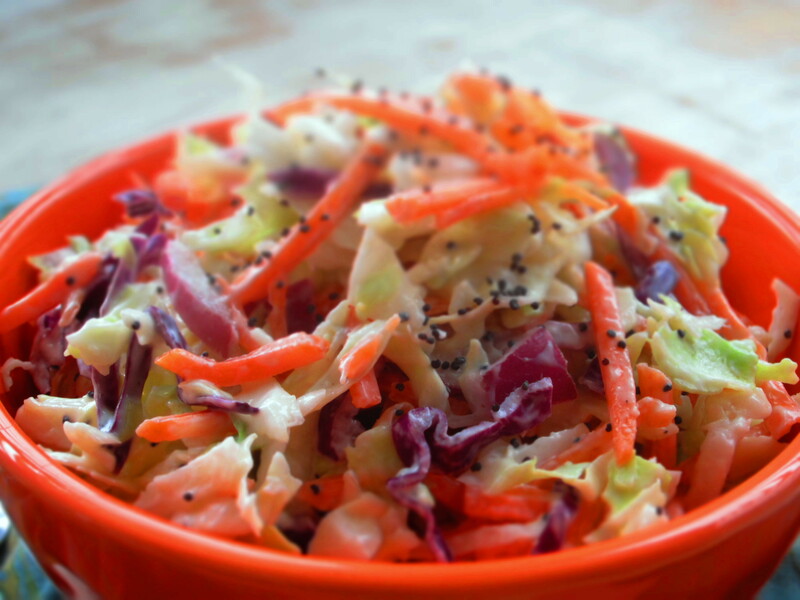 It encompasses the perfect amount of creamy dressing, crunchy cabbage and crisp carrots. And the poppy seeds add beautiful visual appeal (I guess we’ve covered those already). 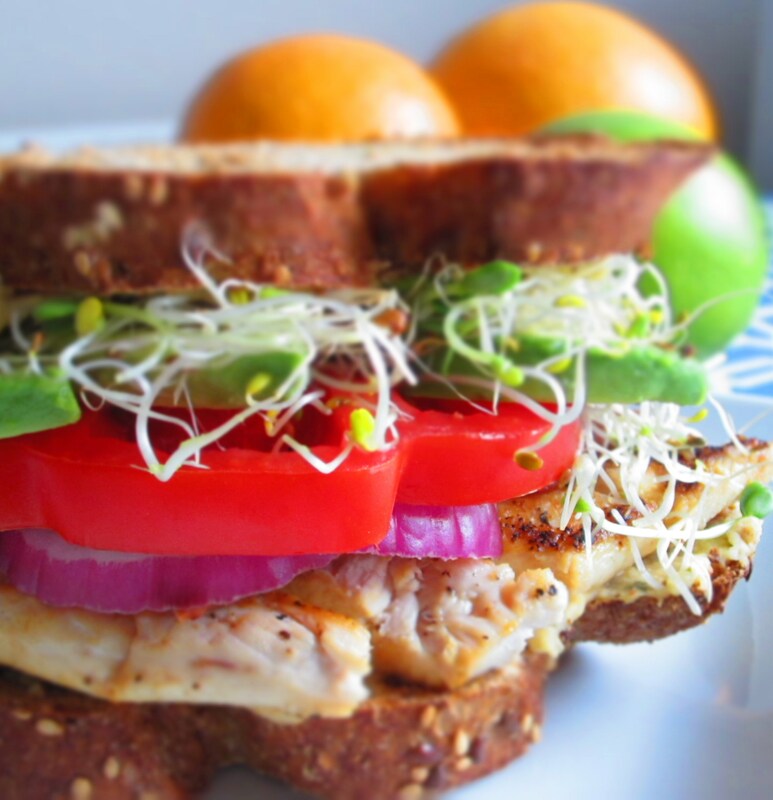 Try serving this fresh tasty side with my California Club Sandwiches and Fresh Fruit Salad with Mint. In a large bowl whisk together mayo, sour cream or yogurt, lemon juice, garlic powder, mustard, honey, salt and pepper. 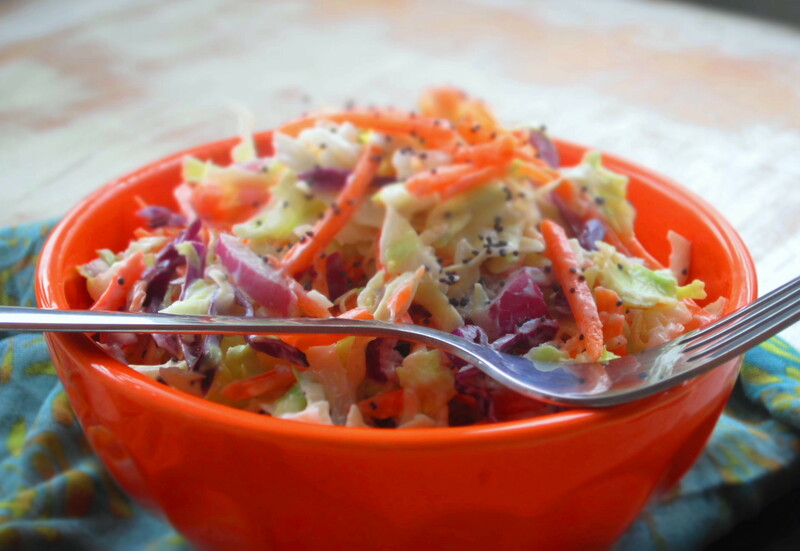 Stir in shredded cabbage, carrot, onion and poppy seeds. Chill until ready to serve (gets better as it sets allowing flavors meld). Serves 10, about 3/4 cup servings. VARIATIONS: Add chopped apples, pineapple, raisins or nuts. 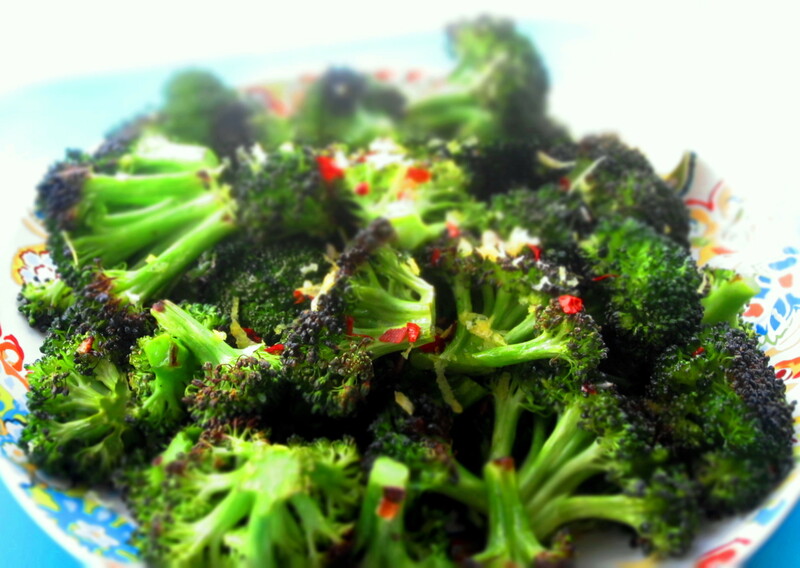 It’s magical… how broccoli can be so transformed spending 15 minutes hanging out in the oven. 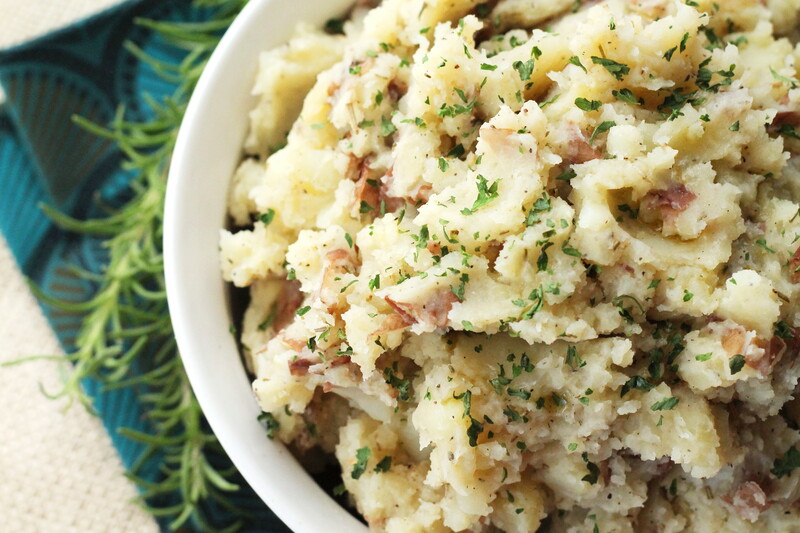 This side dish is so spectacular you will want to triple or quadruple it. I made it a few nights ago as our low carb “garlic bread” with spaghetti squash & basil marinara sauce. I regretted not making more. We ate the whole batch between the two of us. I couldn’t keep my hands of them. No, I didn’t even take the time to grab a fork. I just popped the slightly crunchy, garlicky, lemon vegetables in my mouth. So delicious. 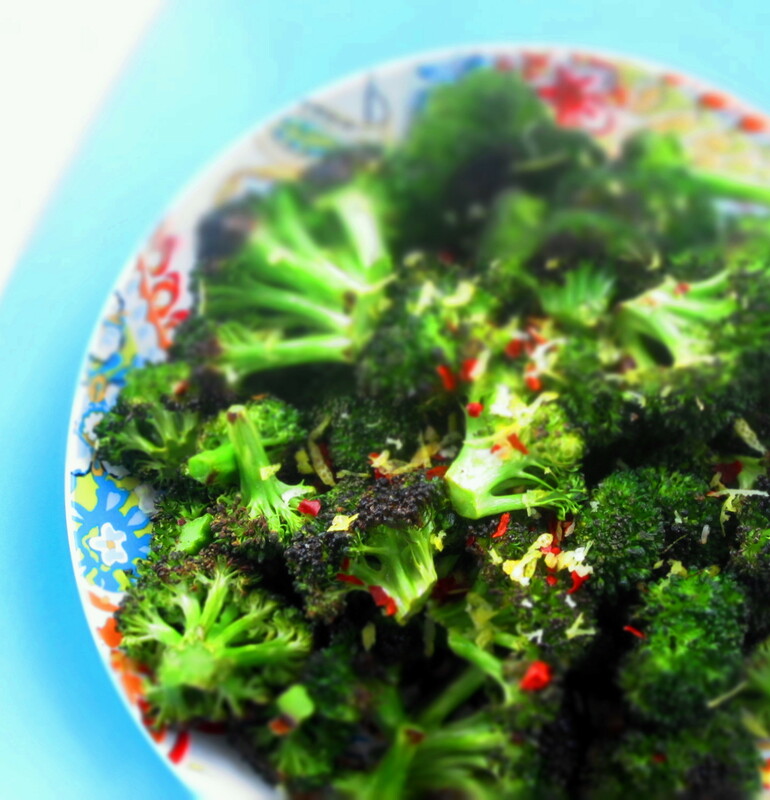 Any adult or kid will eat their broccoli prepared this way. 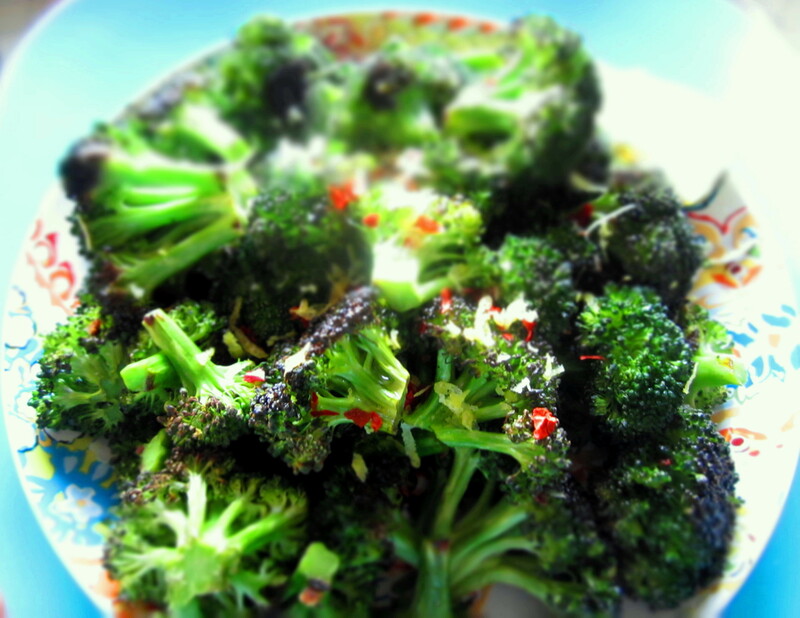 And don’t be afraid to add lemon zest, it compliments the green veg with a pleasantly unexpected burst of fresh flavor. 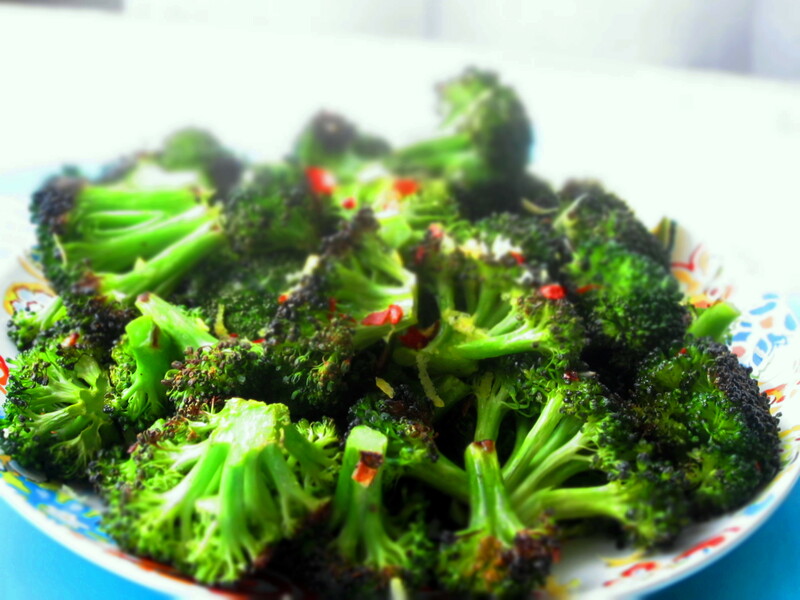 So easy to prepare, you can pick up broccoli and fix it tonight. Beautiful and tasty served alongside a juicy, grilled chicken breast or tossed with hot whole grain pasta, basil pesto sauce, sun dried tomatoes and a little parmesan cheese. A quick addition to any meal or grill out! 1. Preheat oven to 425 degrees F. Spray a large rimmed baking sheet with cooking spray. 2. Place broccoli (I went super quick route and bought pre-chopped organic broccoli florets, but any fresh broccoli will do) on prepared baking sheet with olive oil, garlic, sea salt and pepper to taste; toss with hands to coat. 3. 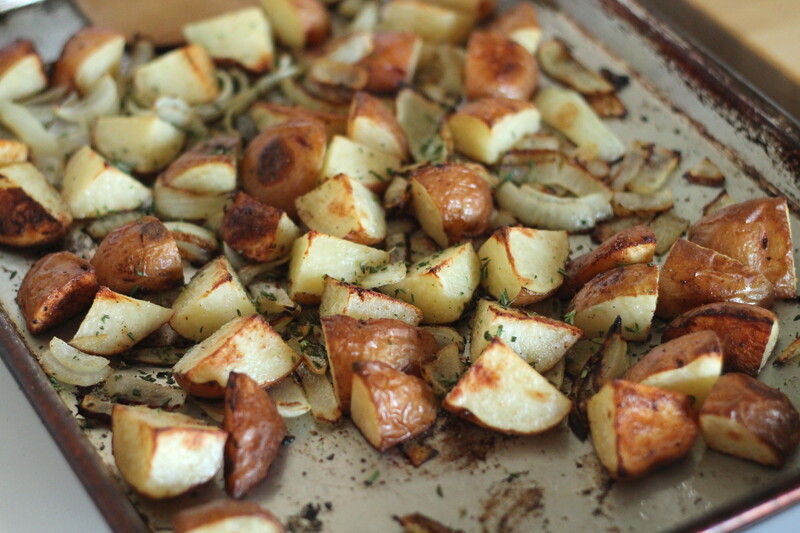 Roast in the oven for about 15 minutes or until lightly browned and caramelized. Top with lemon zest, additional salt and pepper (if needed) and crushed red pepper, if desired and serve. Along with the current almond flour phase, I’m experiencing a quinoa episode as well. I can’t help myself. New ways to use both brilliant natural ingredients keep whirling through my mind. To break up recent habits I switched up my usual flavor profiles and spiced it up with some curry. Oh yes, you heard me right. It’s curry time. Like hammer time. Only without the M.C. And the baggy pants. 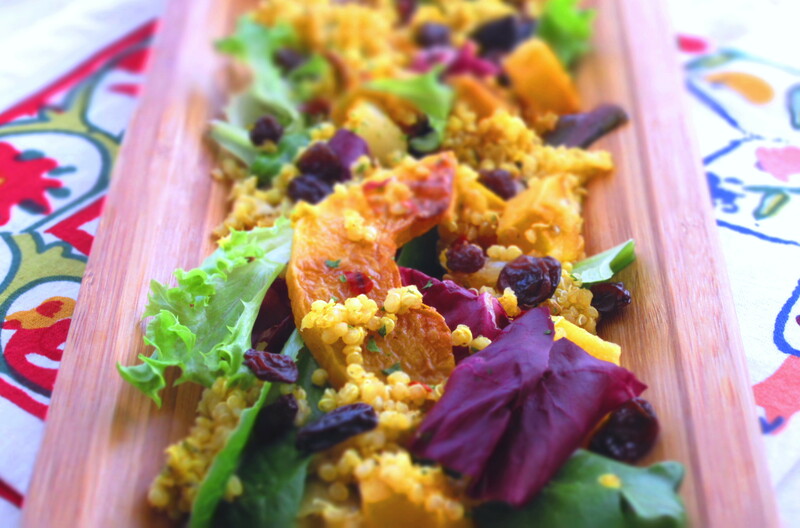 Caramelized buttery squash and chewy sweet raisins accompany the exotic spiced quinoa in this dish. 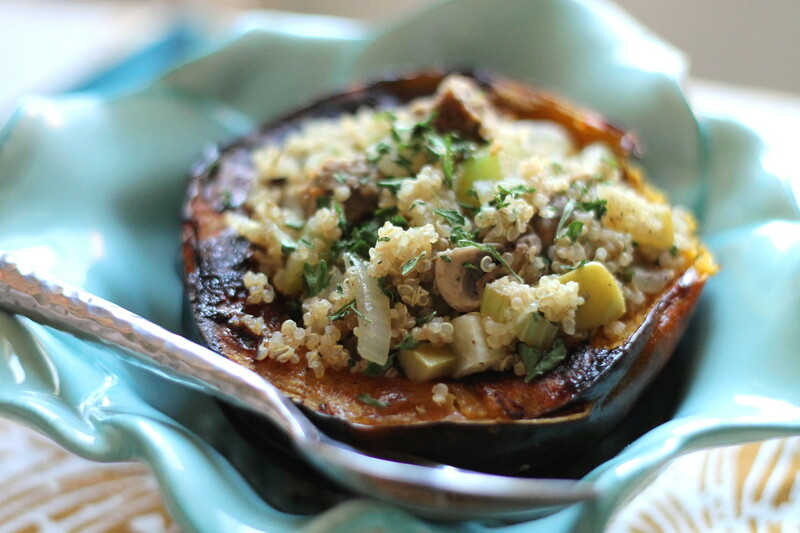 A great side or easy main vegetarian dish. Serve over mixed spring greens and toss with grilled chicken, shrimp or garbanzo beans if you’d like extra protein. It’s excellent, spectacular, really too legit. Gluten free option: Use GF vegetable broth. 1. Rinse quinoa in a mesh strainer and place in a medium saucepan with water and vegetable broth. Bring to a boil and cook for 15 minutes. Reduce heat to low, cover and cook 15-20 minutes longer or until liquid is absorbed. Fluff with a fork. 2. Preheat oven to 425 degrees F. Roughly chop onion into large chunks. Place onion and cubed squash on a large rimmed baking sheet with 2 T. olive oil, salt and pepper; toss with hands to coat. 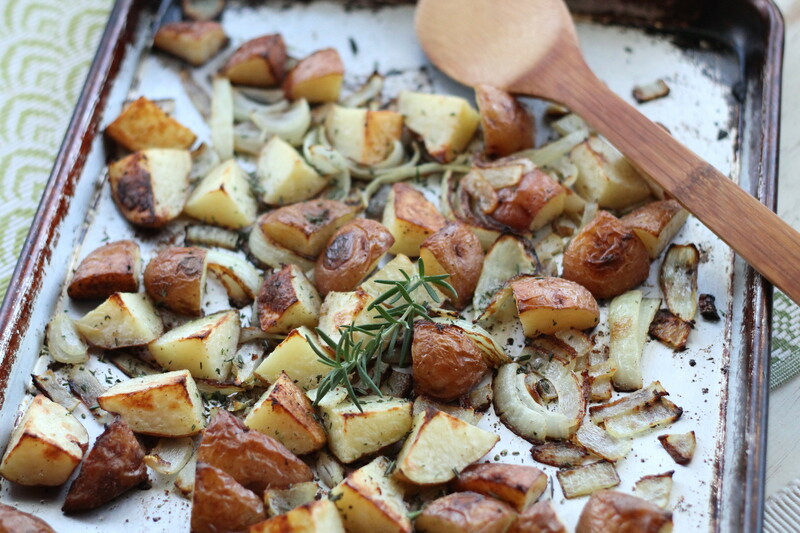 Roast in the oven for 20-25 minutes or until caramelized and cooked through. 3. In a large bowl whisk juice of 1 lemon, 1 T. olive oil, 2 t. honey, garlic, curry powder, parsley, red pepper flake (if using), sea salt and pepper to taste. 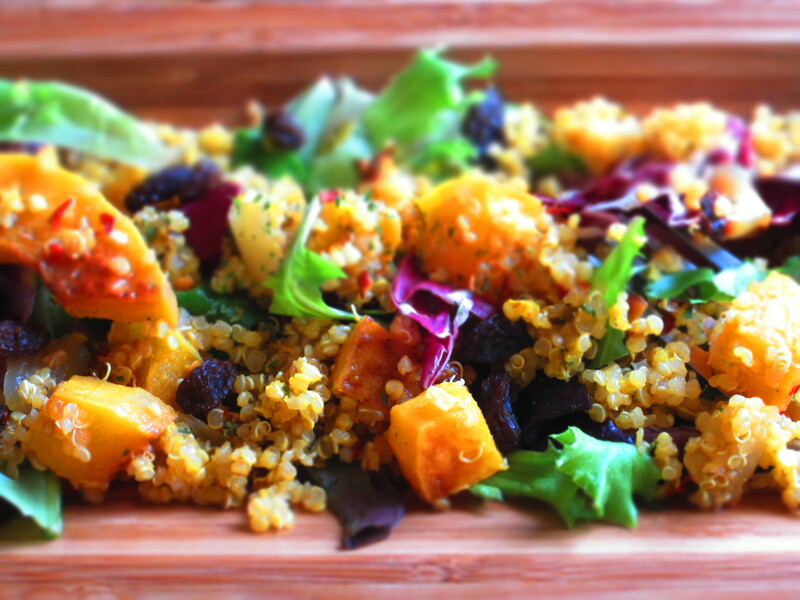 And warm quinoa and squash mixture, toss to coat well with dressing. Fold in raisins; serve warm or cold (even better the next day). 3. 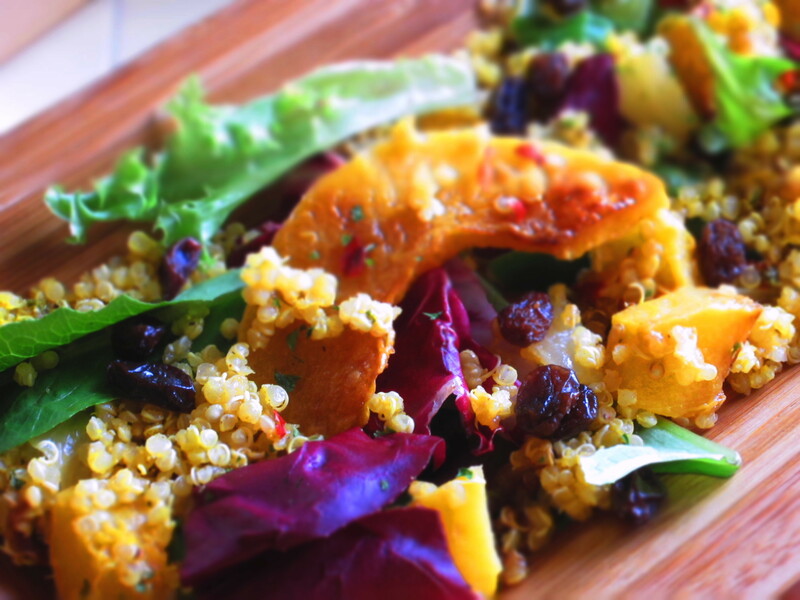 Serve quinoa as is or over mixed spring greens (I prefer a more dry salad, so for an easy vinaigrette just mix fresh lemon juice with good olive oil, salt and pepper). Serving size for 6, about 1 heaping cup quinoa salad. 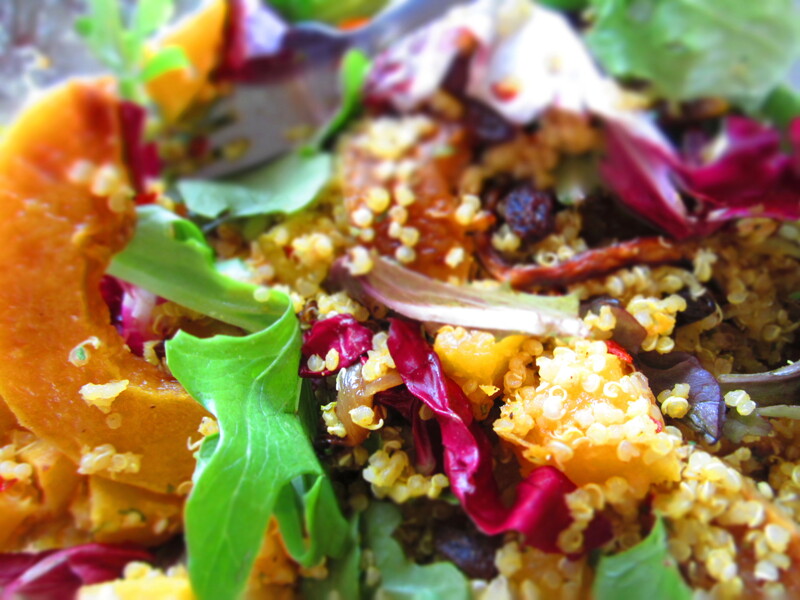 VARIATIONS: Use sweet potato for squash or garbanzo beans. Add chopped nuts like walnuts or almonds for extra crunch, grilled chicken for protein or fresh chopped mint.